University of Alaska Fairbanks is well-known by the name of UAF. The university once established in 1917 and began accepting student in 1922. In the past, UAF was named as Alaska Agricultural College and School of Mines. Exact location of UAF is shown on the Map above. It is located in 505 South Chandalar Drive, Fairbanks, Alaska with post-code 99775. UAF has wide selection of degrees and programs. There are 178 degree which cover wide variety of subject. UAF offers a hundred and ninety certificate Programs and Degree which available in more than hundred and twenty of Disciplines. UAF provide Financial Aid for its student. Any student could apply for it in their office at 107 Eielson Building, P.O. Box 756360, Fairbanks, AK 99775. Some requirements may apply. We recommend any student in UAF to apply for scholarship. The criteria to get it vary for each scholarship. We believe each student eligible for scholarship due to easy to fulfill-criteria. The admission always available every year. At this time, student could enroll in Fall this year or Spring next year. Each student may contact Admission Counselor to get more info about the University of Alaska Fairbanks. They also has online form which is useful for anyone whom willing to continue the education in UAF. It is estimated the cost per semester is $8,326 for resident in Alaska and $12,097 for non-resident. The annual fees for resident is $16,652 while non resident at $24,194. Student whom Living on Campus may spent $4,050 for Books/Supplies ($1,400), Transportation ($400) and Miscellaneous/Personal ($2,250). Student whom prefer Living Off Campus may spent $5,650 for Books/Supplies ($1,400), Transportation ($2,000) and Miscellaneous/Personal ($2,250). UAF is moving toward green-environment Campus. It has some Student Residence Halls which are Smoke-free. UAF has modern facilities along with complete infrastructure. Hockey is the most popular sport in UAF. It has a Hockey team named as Alaska Nanooks which already win lots of tournaments. 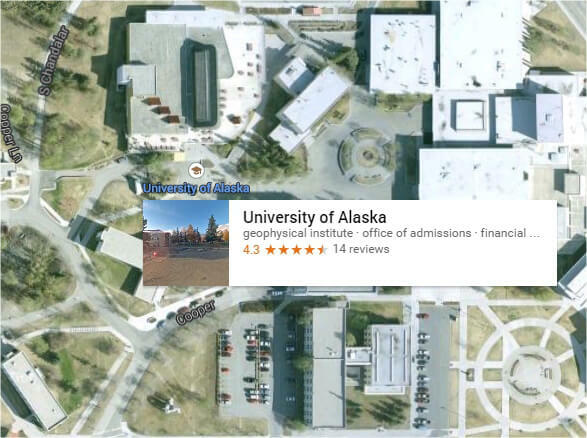 University of Alaska Fairbanks (UAF) is quite popular in Alaska. The university has been accredited by legal entities in united states and there is no doubt UAF is good choice for student in Alaska. Financial Aids and Scholarship are available for qualified student. Due to wide selection of degrees and programs, UAF has become one of Favorite University in United States. University of Alaska Fairbanks always open admission every year and has wide selection of degrees and programs.